** Many reactions used in analytical chemistry never result in complete conversion of reactants to products. Instead, they proceed to a state of chemical equilibrium in which the ratio of concentrations of reactants and products is constant. 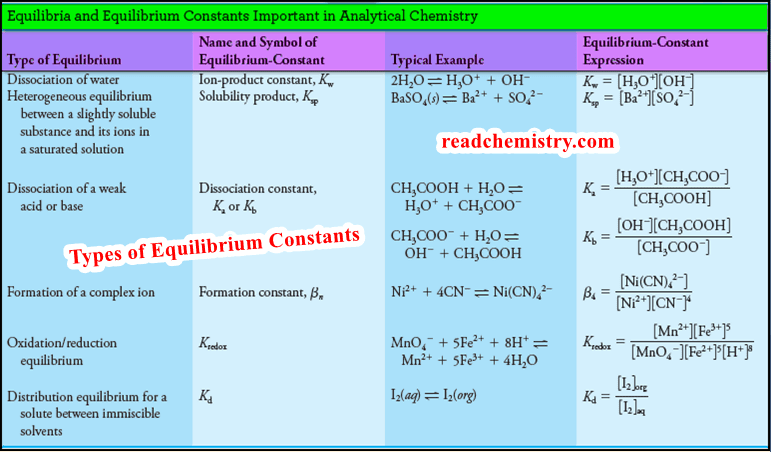 ** Equilibrium- constant expressions are algebraic equations that describe the concentration relationships among reactants and products at equilibrium. Among other things, equilibrium-constant expressions permit calculation of the error in an analysis resulting from the quantity of unreacted analyte that remains when equilibrium has been reached. ** In the discussion that follows, we cover the use of equilibrium-constant expressions to gain information about analytical systems in which no more than one or two equilibria are present. We can follow the rate of this reaction and the extent to which it proceeds to the right by monitoring the appearance of the orange-red color of the triiodide ion I3-. (The other participants in the reaction are colorless) For example, if 1 mmol of arsenic acid, H3AsO4, is added to 100 mL of a solution containing 3 mmol of potassium iodide, the red color of the triiodide ion appears almost immediately. Within a few seconds, the intensity of the color becomes constant, showing that the triiodide concentration has become constant (see color plates 1b and 2b). ** Ultimately, the color of the two solutions is identical. Many other combinations of the four reactants can be used to yield solutions that are indistinguishable from the two just described. ** The results of the experiments shown in color plates 1–3 illustrate that the concentration relationship at chemical equilibrium (that is, the position of equilibrium) is independent of the route to the equilibrium state. This relationship is altered by applying stress to the system, however. Such stresses include changes in temperature, in pressure (if one of the reactants or products is a gas), or in total concentration of a reactant or a product. These effects can be predicted qualitatively from the Le Châtelier’s principle. ** Le Châtelier’s principle states that " the position of chemical equilibrium always shifts in a direction that tends to relieve the effect of an applied stress". For example, an increase in temperature of a system alters the concentration relationship in the direction that tends to absorb heat, and an increase in pressure favors those participants that occupy a smaller total volume. ** In an analysis, the effect of introducing an additional amount of a reactant or product to the reaction mixture is particularly important. The resulting stress is relieved by a shift in equilibrium in the direction that tends to use up the added substance. Thus, for the equilibrium we have been considering (Equation 1), the addition of arsenic acid (H3AsO4) or hydrogen ions causes an increase in color as more triiodide ion and arsenous acid are formed. Adding arsenous acid has the reverse effect. An equilibrium shift brought about by changing the amount of one of the participating reactants or products is called a mass-action effect. ** Theoretical and experimental studies of reacting systems on the molecular level show that reactions among the participating species continue even after equilibrium is achieved. The concentration ratio of reactants and products is constant because the rates of the forward and reverse reactions are precisely equal. In other words, chemical equilibrium is a dynamic state in which the rates of the forward and reverse reactions are identical. (2) Le Châtelier’s principle states that the position of an equilibrium always shifts in such a direction as to relieve a stress that is applied to the system. (3) The mass-action effect is a shift in the position of an equilibrium caused by adding one of the reactants or products to a system. (4) Equilibrium is a dynamic process. Although chemical reactions appear to stop at equilibrium, in fact, the amounts of reactants and products are constant because the rates of the forward and reverse processes are exactly the same. (5) Chemical thermodynamics is a branch of chemistry that concerns the flow of heat and energy in chemical reactions. The position of a chemical equilibrium is related to these energy changes. ** The influence of concentration or pressure (if the participants are gases) on the position of a chemical equilibrium is conveniently described in quantitative terms by means of an equilibrium-constant expression. ** Equilibrium-constant expressions are derived from thermodynamics. They are important because they allow us to predict the direction and completeness of chemical reactions. ** An equilibrium-constant expression, however, yields no information concerning the rate of a reaction. In fact, we sometimes find reactions that have highly favorable equilibrium constants but are of little analytical use because they are so slow. This limitation can often be overcome by the use of a catalyst, which speeds the approach to equilibrium without changing its position. (1) molar concentrations if they represent dissolved solutes. We discuss the basis for this simplification in the sections that follow. ** The constant K in Equation (3) is a temperature-dependent numerical quantity called the equilibrium constant. By convention, the concentrations of the products, as the equation is written, are always placed in the numerator and the concentrations of the reactants are always in the denominator. ** Equation (3) is only an approximate form of a thermodynamic equilibrium constant expression. The exact form is given by Equation (4). Generally, we use the approximate form of this equation because it is less tedious and time consuming. 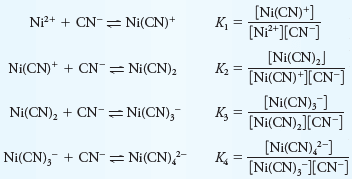 The formation of Ni(CN)4 -2 (Table 1) is typical in that it occurs in steps as shown.